Did you know that on 18th April 1855, only 87 of the Médoc and Sauterne wines had been classified as being a ‘Grand Cru’? This classification was requested by Napoléon III on the occasion of the Universal Exhibition. Note only one Graves: Château Haut-Brion also received that great honour. This hierarchy says a lot more about the origins of the region and about the wine trade than simply about the châteaux themselves. The responsibility for drawing up the list was given to the Bordeaux Trade Brokers by the Chamber of Commerce. The initial idea was to establish a classification based on many years of trade experience, which was the recognition for each estate of its Terroir and reputation. The classification was the confirmation of an existing market and the evolution over more than a century. No one today would say that the judgement of the brokers of 1855 could be applied to what is currently happening in the Bordeaux region but their list is still valid. It has kept its promotional value, not only for the wines that are ‘Classés’ but also for those of the whole region. No other world region has a comparable list which is not only extremely prestigious but also reassuring and help novices in their first choice of quality wine. 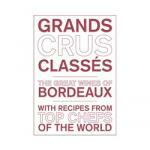 The Label “Grand Cru Classé” is legendary in terms of quality.. Both the list itself and the chateaux which are listed on it are have a mythical status which indicate the possibility of perfection in an imperfect world and through these wines which provide so much joy and satisfaction to all the wine lovers and oenophiles around the world, its concretisation. Dewey Markham Jr, took this to another level by asking the top chefs from all around the world to put together a dish to accompany one of the Grands Crus Classés from the list below. The result is a magnificent book which is both a feast for the eye and a real pleasure to read. It makes the perfect present for the discerning person. Barsac estates may be classified under Barsac or Sauternes.